In the early 1960s, Johnnie Bryan “J.B.” Hunt began producing poultry litter and selling it to poultry companies in Arkansas. He set up such a company in Stuttgart in 1961 but lost over $20,000 the first year. Eventually, the company turned around, and Hunt was shipping poultry throughout the nation. In 1969, Hunt established a trucking company—with five trucks and seven trailers in the beginning—as a sideline business to his poultry feed company. A decade later, J. B. Hunt Transport Services was shipping goods across the country, and Hunt’s trucking firm eventually became the largest publicly held trucking company in America. By the 1990s, Hunt presided over a company that was earning over $1 billion annually and was employing thousands of people. The company also spread to Mexico and formed a lucrative partnership with the Santa Fe Railroad—a move that shocked industry insiders but proved to be a winning strategy. 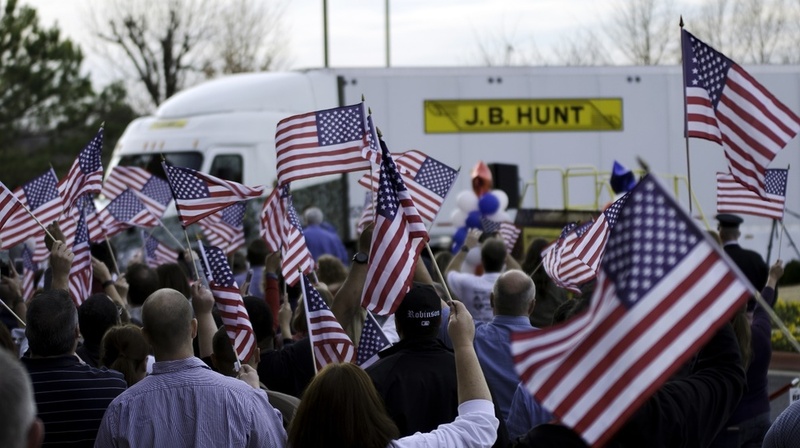 J.B. Hunt Transport Services, Inc., a Fortune 500 company and one of the largest transportation logistics companies in North America, provides safe and reliable transportation services to a diverse group of customers throughout the continental United States, Canada and Mexico. Utilizing an integrated, multimodal approach, we provide capacity-oriented solutions centered on delivering customer value and industry-leading service. We also provide customized freight movement, revenue equipment, labor and systems services that are tailored to meet individual customers' requirements and typically involve long-term contracts. Our commitment to bringing you improved workflows, tighter integration, mobile tools and constant innovation is ongoing. Introducing J.B. Hunt 360, our intuitive new transportation management system. Whether you need to get a quote, book and track a shipment or create an online report, J.B. Hunt 360 provides all the tools you need for a quick and easy interaction, right at your fingertips.